Subsea Tooling Services UK Ltd (STS) now offer a range of clump weights. All our clump weights are built to the highest standard and come fully certified. 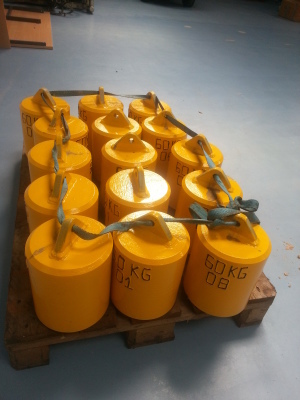 Currently our most common clump weight is the 60 Kg type which is used mainly as a subsea transponder anchor weight. We can manufacture clump weights to customer designs or we can build them to our own specifications. All clump weights will can be supplied with dedicated certified rigging on request. We pride ourselves on our ability to manufacture clump weights in a short lead time in large quantities.